Powdered dyes are what all other candle dyes are made from. Extremely concentrated, a little goes a LONG way! Usage can vary from as little as .01% for a light shade, to .05% for a dark shade. An amount of this powder equal to a toothpick tip will color an 8 oz candle to a medium shade. 1/2 ounce of powder dye will color about 150-200 pounds of wax to a medium shade. Can be used for coloring gel wax, paraffin wax, palm, veggie based waxes and soy wax. Please note: Due to the slight color variances in computer monitors, we ask that you use the images for reference only. 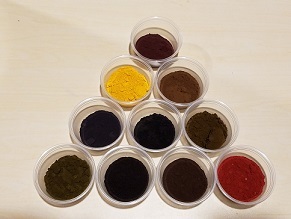 Sample packs of our powder dye are available. Great product, did exactly what it promised. I used just about the tip of a toothpick and colored 1lb of tart wax. I'm hooked on it.